Old Man Winter is outside right now and Punxsutawney Phil predicted six more weeks of winter, so it's total cabin fever for those who love lounging on the deck and soaking up every minute of that natural Vitamin D. Thanks to today's collaboration with De'Longhi, we are sharing a great way to celebrate summertime, wedding showers, and bachelor parties all in the comfort of your home! We were inspired by their versatile countertop beauty, the Livenza All-Day Grill found on Bloomingdale's Wedding Registry, to create an indoor bachelor party that is all about chillin' and grillin' in style with your friends. Whether you want to grill some kabobs, steak, or paninis for your get together, there are so many fun and easy foodie options to get everyone's tastebuds watering with that delicious smoky aroma we all love. So if summertime won't come to you, you BYOS (bring your own summertime, of course)! 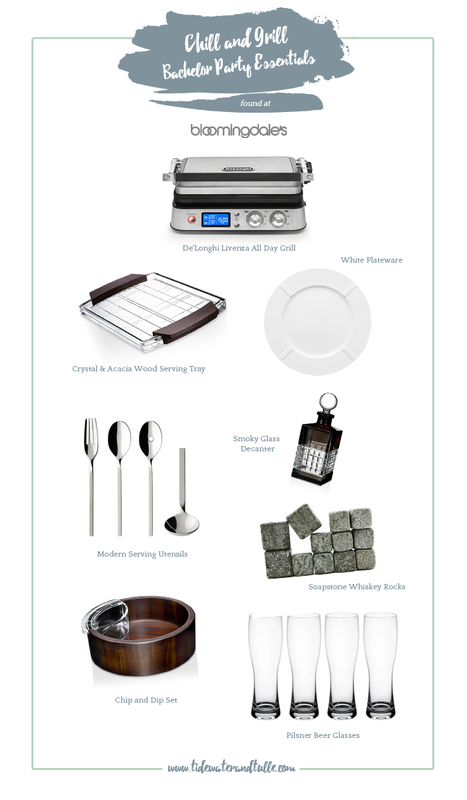 Inspired by smoke and modern masculine kitchen aesthetic, we have curated our top favorite wedding registry finds at Bloomingdale's to help make your own "Chill and Grill" party a stylish and functional hit as well as our top tips on how to decide what to put on your wedding registry. There's so much out there, so how do you choose? Let's find out! Select versatile and classic pieces to add to your home. As you venture into your married years, your home style as a couple is going to evolve. By selecting classic designs, you're allowing your wedding registry items to grow and refine with you as you move to different houses, expand your family, and other life-influenced events. Some of us personally have our original dining plates from nearly 10 years ago because they're neutral in color and match everything! Be selective about appliances. You only have so much space, so consider why you want that appliance and if you see yourself using it at least twice a month. 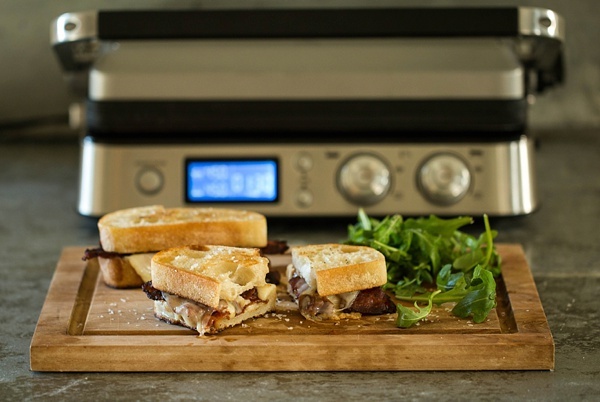 If you love grilling but live in an apartment, De'Longhi's Livenza All-Day Grill is the perfect addition to your list (bonus that we love: the cooking parts are dishwasher-safe making clean up super easy!). If you aren't microwave people, consider selecting a nice toaster oven for your last minute frozen meals. If your blood is practically a fruity smoothie, a blender is non-negotiable. Whatever it is, high quality appliances are built to last and are around for the long haul! While you should mostly stick to the classics, have fun and throw in a wild card. Wedding registries don't have to be 100% practical. You should feel free to add in a few things that you might not buy yourself but would really love to have or try out. Just consider space, functionality, and versatility when choosing these items. Once you're covered with the Grill portion of your party thanks to your De'Longhi Livenza All-Day Grill, now all you need is some Chill! Set up diverse activities. Whether it's a movie marathon, poker game, or turning on the video game system, keep it relaxed with making sure there is enough for people to do while hanging out. Let your guests know what's available when they arrive. If you have a larger crowd, consider setting up activity stations so people can choose what they want to do. And if it's a smaller group, switch up your activities every hour and a half or so. The key to a completely "chill" event is being prepared. Remember the munchies. People gotta eat! Beyond the grill food, have finger foods and snacks on hand for everyone to graze on. Popcorn, nachos, chips and dip, and sweet treats are the perfect side dishes to have around the house for people to pick up and munch. You don't have to get all gourmet to make tummies happy! Provide both alcoholic and non-alcoholic beverages. We think beer, wine, and whiskey are always nice to have on hand when entertaining, but don't forget about your friends who prefer not to drink alcohol. Have water, soda, and juices ready to avoid any awkward conversations and be the perfect host! Many thanks to De'Longhi for sponsoring this wedding registry goodies post with Tidewater and Tulle! And while the disclaimer is that we were sponsored through compensation to write this, these words and our love for the brand are all our own. Some of the above product links are affiliate-linked and purchasing through these links helps support our wonderful sponsors and Tidewater and Tulle! You can find our full affiliate disclosure policy here.